The northern reaches of the Black Mire were known as Karit Aun to the dwarves of Kuln – the areas where the swamps abutted directly into the foothills of the mountains west of the Ironflow. Karit Aun roughly translates to Stone Waters, but more generally the “Granite Marsh”. 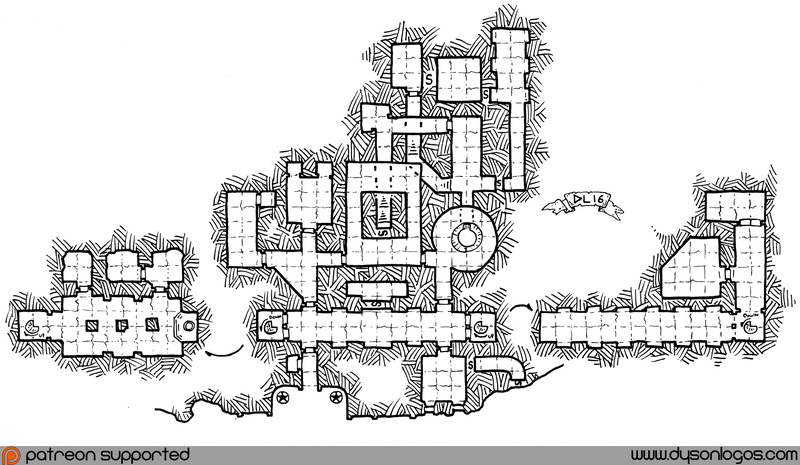 One of the outer structures of the Citadel of Kuln was the Carmine Archives, cut into the red granite foothills of the mountain where outsiders could come and study those parts of dwarven lore opened to their perusal. Like many of the outer structures of the Citadel, the Archives were not directly tied into the massive underground citadel and were reached overland. With the fall of Kuln, the archives were emptied by the archivists and librarians and sent to other dwarven enclaves, with some parts now at the grand library of Coruvon. Now abandoned by the dwarves, the route to the archives has been reclaimed by the swamp and the facade of the archives themselves is almost completely covered in vines and moss and other greenery, hiding it from prying eyes. Within the old archives now reside a clan of vegepygmies who launch midnight raids to harvest tubers and gourds from the jungle while avoiding the lizardfolk and troglodytes of the area. The vegepygmies remain safe from retaliation because they share their living space with a pack of crimson basilisks attracted to the location by the red stone that enhances their already excellent natural camouflage. The gaze of the crimson basilisk causes creatures to bleed from the eyes, ears, nose and mouth – an effect the vegepygmies are immune to due to their lack of blood. But of course, the tales spread that the archivists and librarians didn’t take everything of importance from the Carmine Archives in their rush to depart – and that some potent MacGuffin still remains stashed away in a secret subarchive, waiting for the bravest and strongest adventurers to find and loot. Very nice map, as usual… but something looks wrong in elevations of the upper (Northern?) section. From the circular stairs you go “North” and then left and down two flights of stairs, or Right through a secret door. then the two options meet on the same level… Missing a slope or stairs on the right most secret room? Indeed, the secret passage is sloped downwards towards the upper right room, and the secret doors can be classic old school doors in that they open 10′ above floor level in the lower room. Love the aspect of a secret room off of a secret room. Makes me wonder what was left slumbering.